I've been home from ISTE 2014 in Atlanta for a few days now and I think I'm finally coming down from the ISTE high. You see, ISTE is like no other conference. It is five days filled with love, laughter, learning, and very little sleep. Picking a highlight is tough as there are so many highlights to mention. Let me try to put into words some of them. ISTE is HUGE in size, with over 16,000 participants coming from all over the world. Without a doubt the connections with PEOPLE is what makes ISTE for me. It is where on line connections become face to face connections and this years ISTE was no exception. I was fortunate to reconnect with so many inspiring educators from around the globe. I was also fortunate to meet, for the first time, so many other educators. Last year blew me away with all the incredible people I met, and this year just continued to do the same. I can't even begin to share with you how many face to face hugs I gave and received. This year the ISTE love was very strong. What was different for me at this years ISTE vs last years ISTE is the additional families that I now belong to in the EdTech world. ISTE brought many of these "families" together. At times I was hanging with my incredible Surrey Schools family, those who work with me in our innovative district. At other times I was hanging with my Apple Distinguished Educator family, yet another group of incredibly inspiring educators. I met many of my Google Certified Teacher family for the very first time (we don't actually meet as an entire group until later this month). I hung with many of my incredible twitter friends and my global classroom friends too. I was part of Voxer groups with many other inspiring educators. I have so many different families in my connected world and I did my best to spend time with each and everyone of them. It was, in so many ways, like a massive family reunion. It was wonderful! The people I am connected with were not just conference participants. I have really great relationships with many of the vendors as well. I had an incredible time meeting and face to face connecting with many of the websites and apps that I use and love. These included people from Fresh Grade, Discovery Education, Osmo, Remind, and Padlet. They are all such incredible people doing amazing things for students and teachers. I spent time talking with start ups and well established companies sharing my view point from an early years teacher perspective. These people were equally as important to me as my fellow attendees. Here's a little collage of some of the people I connected with. The things is, I didn't take any of these pictures. They were all shared with me by the people who did. 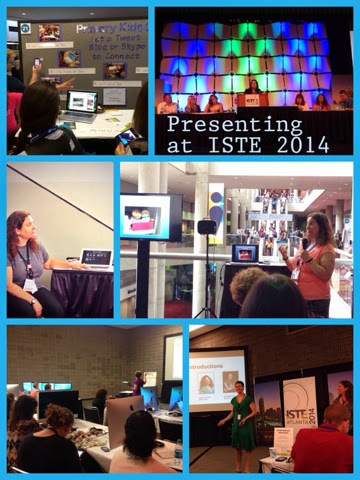 When I left ISTE in 2013 one of the goals I set for myself was to try to present at ISTE 2014 and share more of what I am doing with young learners. I wanted to share beyond this blog and so I submitted several proposals to present. But presenting at ISTE is a highly competitive process so to say that I was blown away when I found out four of my five proposals were accepted was an understatement. Along the way I picked up two more presenting opportunities - one with the Early Years playground, and one with the Apple playground. Needless to say all this presenting had me running around a fair bit but I wouldn't have traded that for anything, not this year. I feel extremely honoured to have been able to do a poster session and 3 hour workshop with Kathy Cassidy, be a part of a panel on Genius Hour with Vicki Davis, Angela Maiers, Erin Klein, Sylvia Martinez, Don Wettrick, and fellow Surrey teacher Hugh McDonald, and present a BYOD session with the brilliant Michelle Cordy. With my two playground presentations I presented six different times on six completely different topics and loved every minute of it. Okay, I won't lie I had my moments when I was extremely nervous but hopefully that didn't show through while I was presenting. I was also truly inspired by those I was presenting with, and at times felt out of my league. I am super grateful for the presenting opportunities I had. This high volume of presenting made me realize that I do belong in this presenting circuit. I have good things to share and I love sharing them. The feedback I received was positive and who knows if futures presentation opportunities will come my way because of it. In any case I did what I set out to do and shared more of what is possible with young learners. If you weren't able to attend ISTE here are some links to some of my presentation handouts or slides. While my time to attend sessions was some what limited because of all the presenting I was doing I did manage to attend sessions too. Ignite sessions are a total highlight for me as I love to learn from inspiring people sharing their passions. This year was extra special as I personally knew several of the people presenting. While some of my friends seemed disappointed with their ignites I can't be more proud of the way they all inspired the large crowds. Who knows, maybe next year I'll submit to do an ignite session too. I enjoyed the second and third keynotes sessions from the Blogger's cafe. Kathy and I missed the first keynote because we were setting up our poster session. I also managed to hit some of the playgrounds and poster sessions which I also find equally inspiring. I love the way you can wander from table to table, stop for as little or as long as you want, and keep moving. I picked up a lot of contact information from the poster sessions and I look forward to diving a bit deeper and learning a bit more. So many questions I have, always. I also sat in on a few sessions, one of the highlights being my dear friend Kristin Ziemke's session with her co author Katie Muhtaris. There were many great sessions on the program but I must admit I missed many because of all the presenting I was doing. The other thing about ISTE that those who have never been before may not know is that there is an entirely separate schedule of events you can attend outside of the actual "conference hours". Last year I got swept up into attending up to five events a night. This year I knew I couldn't do that again because quantity never replaces quality. Picking and choosing which family event to attend was not always easy but I tried my best to attend a variety of events. Some of my highlights included time with my Surrey team, including honorary member Bill Ferriter and his buddies John Spencer, and Phillip Cummings; breakfast with Heinemann publishing celebrating Kristin Z and Katie M; and the Atlanta Braves baseball game with the Fresh Grade crew. I loved all the events I attended "after hours" because each one connected me with one of my many Ed Tech families. I am very blessed to be a part of so many amazing families. As you can probably gather from all the above writing ISTE was an extremely positive experience for me. However as a reflective practitioner not everything was positive. Here are a few things I hope will change for next time. While I mentioned some really fantastic ed tech companies above I was some what disappointed with the vendor floor, but more specifically the companies that were trying to sell me products to manage/control my students. I get that technology is suppose to make our lives "easier" but nothing will every replace the one on one relationships I build with each an every one of my students. Many of the companies I saw promoting their products fell within the realms of promoting bad teaching pedagogy. A couple of the ignite presentations were more like informercials selling products then teachers sharing their passions. What bothered me most about this is that their slides were submitted weeks earlier and it should have been recognized that these presentations did not belong in the ignite venue. They would have been perfect on the vendor floor, but they left an awful taste in my mouth during the ignite session. To make matters worse I know a few very inspiring educators who submitted to do an ignite session and were not accepted. Obviously ISTE can't accept everyone but these informercials were a huge slap in the face of those whose inspiring ignites were not chosen. This year I once again missed great sessions. Sometimes I missed them because I was presenting at the same time, but in other cases I missed them because I had no idea a certain person was presenting or a certain event was happening. The ISTE program is so over whelming that no matter how much time you spend covering the presenters and topics you still miss many excellent sessions. Unfortunately I'm not sure what the solution is expect perhaps try a bit better next year. This is a tough one for me because I love to present and share but perhaps presenting six times in four days while trying to find quality time with incredible people may have been a bit too much. But when I think about what I presented and who I presented with it's tough to find out where I should have cut back. Something I will certainly think about next year when I start to submit my presentation proposals. This year I once again tried really hard to connect with as many people as I could but I still managed to miss spending quality time with people. Krissy Venosdale is one who comes to mind first. She and I managed to sneak away for 1:1 time, and small group time at last years ISTE but this year our schedules just never seemed to click. Yes, I did see her, and hugs were exchanged of course, but our time together was way too short. I have no idea when I'll be face to face with her again so it's a tough one for me to stomach. Over all though ISTE was, once again, an incredible experience. I am so thankful I was able to share it with some of my Surrey Schools colleagues as our converstaions will continue long after the conference has ended. Will I be back next year? You betcha as long as I can save enough to fund the trip. (Hey, anyone want to sponsor me?) Thankfully, next year ISTE is once again after the Canadian school year is over which means if I can get my funding in order, I won't have to worry about missing my last week of school with my students. This doesn't happen often so I need to take advantage of it when it does. I'm sure there were more Canadians at ISTE this year because it took place after Canadian schools finished for the year. If you're able to get to ISTE 2015 in Philly GO! Seriously, you won't regret it. Thank you ISTE for another incredible conference. Great summary of all you accomplished! Because you were so busy (honestly I don't know how you did it all! ), I am even more grateful that we were able to hang out and debrief during the times that we did and keep updated through voxer. Thank you for encouraging me to go and being so helpful with all your advice! You saved me from getting so overwhelmed. I just kept thinking about all you were doing! Thanks Iram. As you know I always enjoy the times when we are able to connect over conversation. 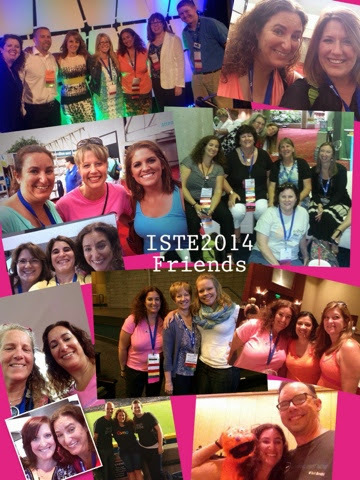 I am so glad so many of us were able to get to ISTE this year. It really is such an incredible conference for so many different reasons and I'm glad more of the amazing #sd36learn team was able to enjoy it. I'm hoping I can convince others to come back again next year as it will be a while before it's not during in session school hours after next year. Sounds incredibly amazing. Thanks for the links you shared. Will be checking them out. You have so much to share, Karen. 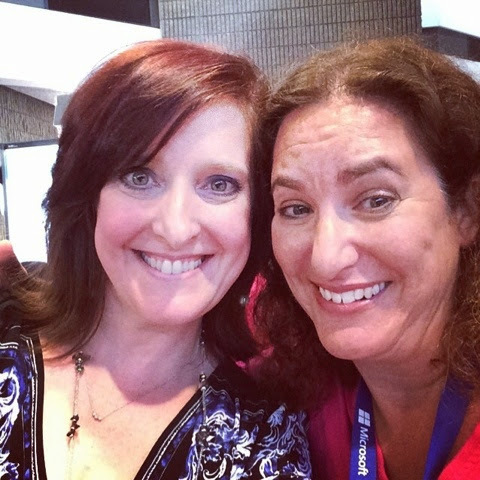 So glad you took on the challenge of presenting at ISTE this year! This is a great collection of resources, Karen. Thank you for sharing them. It was wonderful to meet you in Atlanta. I hope our paths cross again very soon. I enjoy learning with you.